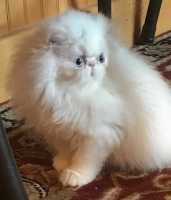 Halo is a specticular blue-eyed White show female persian born to CH Autumn-Purrs Blue Beard of AutumnPurrs and KYCC Jyn-Erso of Purrden Me . 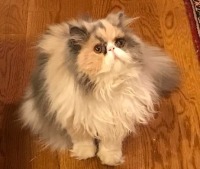 Willow is a beautiful dilute calico show female persian born to S-CH Troll's Jingo Fett of Eldridge and D-CH Eldridge's Padme. 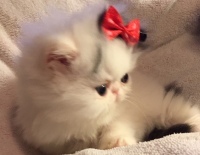 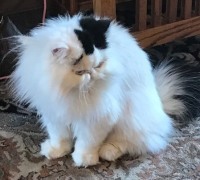 Splash is a striking black and white exotic show female persian born to Persianrose Mozzy Man and Persianrose Santana's Coat of Many Colors. 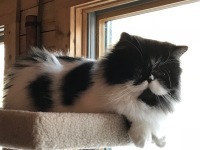 Ari is a stunning pure black/white show Van female persian born to Wuv-Paws Frostee of Precious Cats and Desert Beam Penne of OpalAnnies . 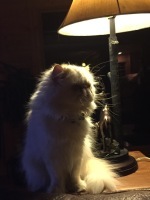 Ojo is a magnificent flame point male persian born to CH Sache Heaven Canwait and Angel Paws Grace of Kelly Katz. 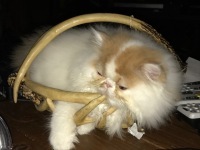 Echo is a handsome red and white show male persian born to GC Designerpurr AZ Jax of Purrden Me and CH Ocalicos Hilde of Purfect Gift.